I know my posts are growing fewer and further between. Journaling my grief lately just hasn't really appealed to me. The reason is all the same...I am just tired of it all. Crying doesn't really make me feel better. Writing doesn't really make me feel better. Remembering doesn't make me feel better... It's all the same. Nothing will bring her back...and so the pain will always remain. There have been a lot of changes going on in our lives this summer and I'm sure I will update on here, sooner or later. I like change, actually. I kind of thrive off of it. It also helps to give me something to obsess over...which is something that I look for these days. Distraction. I earnestly look for new distractions to obsess over and keep my mind busy so that I won't stop and dwell on my sadness and empty heart. Otherwise I just constantly feel dead inside. One good update to write about is that Mark and I have finally found a counselor that we really really like. We have been to see him about 4 times now and we are really impressed. He was referred to us by a friend at our church and I couldn't be more thankful for her adamant referral of him. A counselor who actually truly deeply cares? Wow - who would've thought that would be so hard to find? In just 4 short sessions, this man has taken us under his wing. His compassion towards us is palpable in every way he talks to us and, most importantly, listens to us. He has certainly gone above and beyond what I believe most counselors would typically do. For instance: He requested that we bring photos and videos of Vienne so that he may get to know her a bit. He asked permission to read this blog and then he actually DID and wrote us a heartfelt email about how much she touched his life and how angry he feels for us. He spotted some hydrangeas while on a bike ride so stopped and photographed them and framed them and gave them to us! (photography is a hobby of his) Wow. We are astounded. But, beyond what he has "given" us in ways of compassion and support, he is also slowly starting to bring light to some areas that I struggle in. One mainly being my self-worth, especially after losing Vienne. I never originally thought that I struggled in that area...but he is starting to point some small things out that are giving me much food for thought. As our counselor is getting to know us, he has started to gently point out some things about how I talk about myself. I guess I have a tendency to interject small yet negative adjectives about myself when explaining things. For example: "I struggled with my vanity and my pride when...." or "I know this is weird but...". Nothing overt...but small unnecessary negative comments. He also asserted that he gathers that Mark and I are very selfless people - conscientious and thoughtful and caring. Nothing wrong with that at all, though he did point out that sometimes that means we might not take time to actually care for ourselves. This gave me something to think about. I know he is right. Allowing my self-care to be put on the back burner and a tendency to interject negative comments about myself all points to my self-worth, in my eyes. When looking at my struggle with my anxiety, I see how that also reflects a struggle with my self-worth. My anxiety gets most intense when things get out of my "control" or don't go as expected or planned, especially in my mothering. I am most paranoid about my mothering to Ivy. Of course I struggle with that. In my disillusioned mind, ultimately, I failed Vienne. With EVERY over-the-top intentional effort I made for Vienne since the moment she was conceived, I still somehow failed in the end. I know I did way more for her than most moms even do. Mothering is my passion. It is what I am good at. But despite all my efforts and plans and intentions I still lost her. I still feel punished. And, so to make up for that, I struggle with putting standards on myself as I mother Ivy...in irrational fear that I could fail her, too. I know this is all irrational. I know most of you who read this want to argue this and tell me that I'm such a great mom. I know I'm a great mom. Deep down, I do know this. But, that voice still reminds me that I failed. And, I know that is the "voice" that the counselor wants to focus on addressing. I want to have something to blame. It's hard for me to let go of that. On the days I don't blame myself, I blame God. Two very difficult things to reconcile. Anyway...so that's where I'm at in my head these days. Striving for distraction so that I can just plug along. It's almost a month until the dreaded one-year-anniversary of her death...the absolute most worst day of my life. Fun times ahead (note my heavy sarcastic tone). Jenny, I think about you and Mark a lot and yet I really don't know you at all! I can't imagine what it is that you are going through. There have been times that I have thought what would I do if something happen to one of my kids and that can only give me a glimpse of what you are going through. I'm so glad that you have been able to find a counselor that you like and feel like there will be progress made. I know they are few and far between out there. Your blog inspires me each and every day to take advantage of the time that we have with our kids. It has also encouraged me to be better at documenting and video taping them! 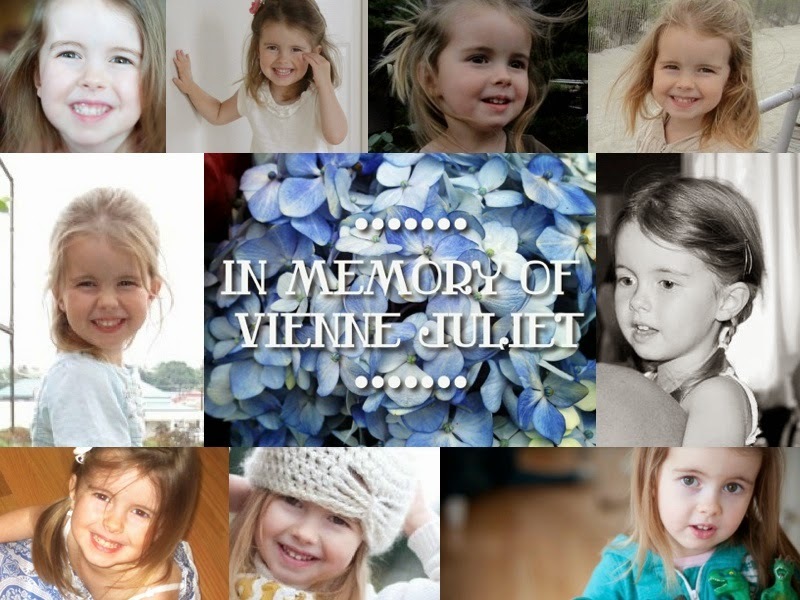 I pray that you and Mark will continue to find healing and comfort in HIS arms as Vienne is! I apologize for such a delayed response...just now finally having the strength and motivation to write back to people....but wanted you to know, Amy, how thankful I am for your comment and just knowing that you stay present by reading my blog and thinking of us. Thank you so much. Lindsay ~ you are so right. Meeting our new counselor surely gave me new perspective. Thank you for your comment and extension of love. I love you friend. Thank you. I know this reply is WAY overdue....but....ach...well, you know. This last month has been impossible for me. You were, and still are, a wonderful mom. That shines through in your beautiful writings. I thought this post from another blog might interest you. It's been 5 years since this lady lost her son but this particular entry, she mentions him having a mild case of flu shortly before passing away. Prayers and hugs to you! Thank you always for your encouragement, dear friend. Just wanted to tell you that you and Mark have been on my mind and heart lately. I was touched by what you wrote about anxiety. In my struggles with anxiety, I have found it to be so difficult for a couple of reasons (at least). First, I feel like I am being attacked from the inside. I like to think of myself as a pretty good problem-solver, but when the source seems to be inside me - and it can attack at any time - I don't know what to do. I feel disempowered, lost, frayed and paralyzed. Second, anxiety is so irrational. It seems to attack me by telling me lies - by convincing me of things I know aren't true. Of course, I am not in any way trying to equate our situations. I know the sources of my anxiety are very different from yours. I'll just be praying that, one morning, you will wake up with a profound sense of peace and that it will stay with you throughout the day.